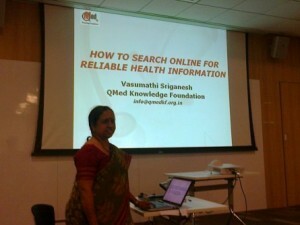 In January 2014, we did three lectures for health consumers on how to search online for reliable health information. We had already done one at HELP (Health Education Library for People) in Dec 2013, and with the encouraging feedback, we could offer this to more organizations. The second lecture (Jan 18) was at the Nehru Centre. The librarian Ms. Arati Desai took the initiative of organizing this one. We again had about 15 participants, with good suggestions and comments coming in. The third (Jan 22) was again at HELP, this time the focus being on information resources and searching online for Diabetes. There were about seven participants – all senior citizens. One of them shared his experience about how it was very confusing, while looking for information. Another mentioned that he would search, but in the end would only take the doctor’s advice, and not do anything with the information he found. Attendees of all lectures loved the idea of learning more, being better informed and having positive interactions with their doctors. This entry was posted in 6 - Old posts and tagged Patient Education. Bookmark the permalink.